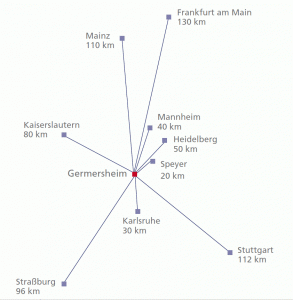 Please, note that Germersheim is located about 110 km away from Mainz in the vicinity of Mannheim and Karlsruhe. The airports Frankfurt (Main) and Stuttgart are the closest main hubs within 1.5 to 2 hours by train. The small airports Frankfurt-Hahn and Karlsruhe-Baden are also within train distance of about 2 hours. Trains to Germersheim run from Mannheim and Karlsruhe main station. In Germersheim, there are two stations near to the university: "Germersheim" and "Germersheim-Mitte/Rhein". From the station "Germersheim", the main station, it takes approximately 20 minutes on foot to reach the faculty; "Germersheim-Mitte/Rhein" is close to the faculty (on foot approximately 10 minutes), but only being served by about every other train. Train travel information for Germany can be found (in English) here.